Is there a secret to fitting the abdomen for a fitted dress? You may not even think to ask this question, but I find that cutting the fabric a bit generously through the center-front seams beginning about three inches below the end of the bust helps give the comfortable belly-forward look of some period art sources. The Parement Master, who painted “a wedding” c. 1380 as seen in Margaret Scott’s A Visual History of Costume: The Fourteenth and Fifteenth Centuries, provides an ideal example of the belly-forward silhouette. The Limbourg Brothers, who painted most of the books of hours so famously commissioned by the Duc de Berry in the early 15th century, also painted women with ample bellies. By “cutting the fabric a bit generously” I mean either flaring your panel pieces with bias edges or adding triangular gores at the point where you want the flare to begin. There is no strict rule about which method is more authentic for this period’s clothing, but one advantage to using gores set in to straight-grain seams is that you will not deal with a bias-to-bias stretch or sag. I’ve done this both ways and find that as long as you let your gown hang for a day or two on a dress form before finishing all the seams, you can comfortably use the bias-to-bias construction without much problem with sagging seams later. This is also dependent on the type of fabric you use — thickness, weave, and fiber content. I like to fit the center-back seam closely until the point at which the backside begins its flare. The side seams can be fit just as closely to the hips, or you may want to flare the fabric from about three inches below the bottom of the bust. One advantage to flaring the side seams at this higher point is to gently disguise any back rolls you may have. I’ve also found that fitting rather tightly through the back smooths out flesh quite nicely. 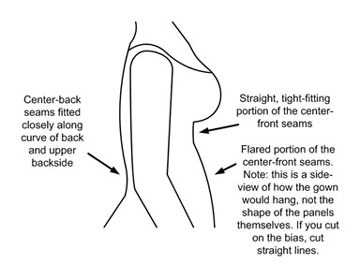 The center-front seam can be closely fitted through the torso until the hips, or like the side seams, can be flared from a point at least a few inches below the bottom of the bust. In effect, you would be creating a falsely high waist, but there is nothing unattractive about that. On the other hand, if you feel comfortable doing it and want to achieve a more fitted look throughout the length of your torso, do not be afraid to fit closely all the way to the hips. This look is certainly found in period art too. An example can be found in Joan Evan’s Dress in Mediaeval France, plate 57, which shows sculptures of female donors to the Abbaye du Trésor, c. 1400, all wearing gowns fitted through the torso. The choice really is yours, depending on how you want your body to appear and what style you are reproducing. Hi I was wondering where the gores would best be placed on a gown like this. I have seen them placed only on the side seams and I have also seen them placed only in the front and back seams. But I wan’t sure if they had specific evidence for one over the other or one gore at all four seams? I cant seam to find anything on the subject either. Any help would be appreciated. Also I am loving your site It is extremely helpful! Hi Whitney, I’m glad the site is useful! I would place gores on all four seams: front, back, and sides. The helps create a balanced, full skirt. Everyone has their own preferences, but I tend to flare the fabric of the main panels past the end of the front opening, and then I add a gore below that in the front. On the sides, I usually add gores somewhere around hip level. In the back, I have tried everywhere from just below the natural waist to half-way down the skirt, and I think I like the back gore to start a little above the curve of the backside. The risk you run is letting the fabric pool into the natural indentation between your cheeks. Wedgie City! Becky, if you download my PDF paper on clothing layers and look at the images included, you’ll see examples of these fitted dresses which do not attempt to make the belly flat, as is the modern preference. As for patterns, if you use the fitting method I describe, and just don’t pin the front too tight over the belly, you should get a gentle curve there which will accommodate the natural shape of most women’s bellies. Best of luck making your clothes!